Pilkington Activ ™ The Worlds First Self-Cleaning Glass. The unique dual-action process of Pilkington Activ TM makes it the most effective self-cleaning glass. An invisible layer, on the outer surface of the glass, reacts with the natural UV energy to break down organic dirt continuously. At the same time it causes rain to run in sheets down your double glazed windows, washing away dirt without leaving streaks. Pilkington Activ TM self-cleaning glass is the latest innovation from a company that has been at the forefront of glass technology for over 170 years. Abbey Glass have been appointed to be Derby's first installer of this brand new Pilkington innovation. 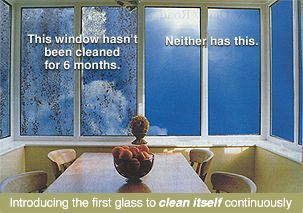 Activ TM self-cleaning glass is available for fitting on all products from double glazed windows to composite doors and conservatories. Abbey Glass and Burton Glass supply Pilkington Activ TM to the areas around Derby and Burton and extend to cover towns including Ashbourne, Belper, Swadlincote, Uttoxeter, Long Eaton, Tamworth and Lichfield.